The perfect, scrumptious appetizer for all your party needs, these Mini Crab Cakes have a zesty flavor and are made right in the oven. Can be baked ahead and placed back in the oven to crisp up for your guests. No frying required, bite-sized and incredibly easy to prepare…need I say more about these Mini Crab Cakes, except you should really think about making these soon…they are so yummy. Last Sunday my friend brought over her incredible crab cakes to my son’s birthday brunch. I haven’t been able to stop thinking about crab since. As I was searching my freezer, I came across some Dungeness crab and proceeded to do a little dance around the kitchen; crab cakes were in my near future. These are truly the perfect little passing hor’dourves, coming together almost effortlessly. The addition of orange and lemon zest gave them a nice burst of citrus flavor. However, the crunchy outside against the creamy inside is really what knocked these out of the park. Spray mini muffin pan with nonstick spray. Toss 1-1/2 cups panko, 3/4 cup Parmesan and 4 Tablespoons chopped chives in a bowl. Drizzle melted butter over, tossing with a fork until evenly moistened. Press 1 rounded Tablespoon panko mixture into bottom of each muffin cup (makes a well with your thumb), forming crust. Spoon 1 generous Tablespoon crab mixture into each cup. Sprinkle more panko mixture over each. 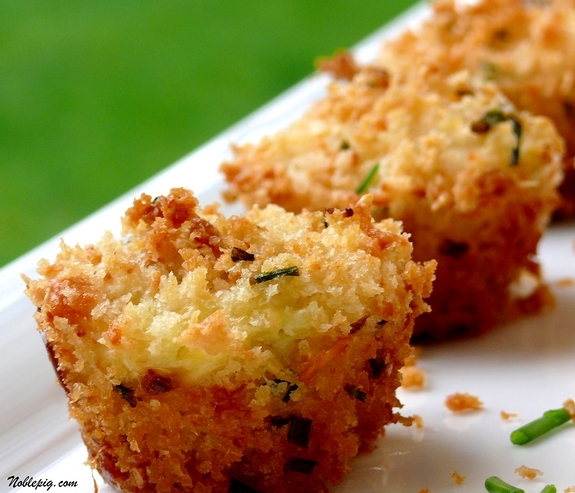 Arrange crab cakes on a serving platter; sprinkle with chives. wow… you always have the best presentation menu items. In a mini muffin pan! Brilliant! I want these so badly…. I don’t care for crab but I think maybe I might be persuaded to try these! What an amazing idea to put them in muffin pans, I absolutely love it. They turned out beautiful! Crab in a muffin tin? GENIUS!!!! OMG I can do these. They are so easy. Thanks for posting this great recipe! Extremely cute! This is something I would love to eat over and over again. Cathy, this crab cakes sound amazing. Got to try it. It’s my favorite thing ever. These are adorable, and as I have some crab in my freezer, I think I’ll try them tomorrow! I love this! Perfect for a party. I am planning on meatloaf in muffin pans one day. But crab cakes? They are one of my very favorite things. I don’t like crab, but these crab cakes look beautiful!! These crab cakes have a grab-factor of 10+. I am off to the fishmonger for sure!!! Been “meat free” these past weeks and LOVING this recipe. I will have to figure out where to buy panko. Crab cakes are great, aren’t they?! When I’m in Maryland I have them every meal. And I love how you baked these in the muffin tins — so much easier and I bet you need less “filler” to hold them together. Brilliant. Oh those look fantastic! 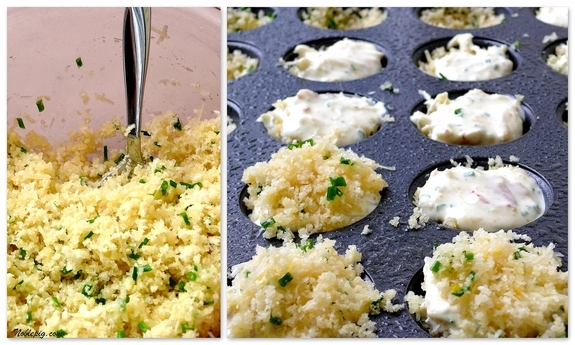 Such a great idea in the mini muffin tin! Wow! These look foodtastic! Love your bio (cracked me up) and recipes of coarse. I am going to be back for sure!!! What a great idea! These would be perfect little appetizers for a get together! These look amazing Cathy and I love that you bake them in the ovein instead of frying…I just love these! I am so glad you posted these. It’s perfect timing as I am planning the menu for a bridal shower and these are perfect. Holy cow Cathy. These are gorgeous and will be going on our Friday night date night menu really soon! Really cute crab cakes! And baking beats frying any day! Oh my these look so good! I have been searching for an hors d’oeuvre for Easter dinner… this might be the one! ok. question for you. I am often left with crabmeat and trying to figure out how to use it up. Does freezing really work well? Does it change the taste/texture. I do have a vacuum sealer. Fabulous idea to bake these in a mini muffin pan! Irresistible little cakes to say the least. I tried them and they went so fast, they didn’t even get a chance to cool. We ate them as they came out of the oven. Truly a great taste sensation! Wow! These look delicious! I just had some fabulous crab cakes at one of our favorite spots last night, but I’m sure they were fried. I’ll be making these soon. Off to bookmark to my delicious cookbook! Bookmarked! I can’t wait to try these. Cathy – these are definitely going to be on my Easter menu – I must have missed it in BA! Another great looking recipe from you! all your great work, I really enjoy your blog. My mom e-mailed me telling me she wants me to make these for her for Mothers Day. They do look pretty tasty so I’ll have no problem granting her wish! Crab cakes are one of my favorites. I love the way these are made! Delicious. Oh and a happy belated birthday to your son! My youngest turned double digits last year…. These look so light and cruncy. With the cream cheese in there, I’m sure I’d love them. These look wonderful and you have no idea how much I love crab cakes. This will be on my agenda for the weekend. Oh. My. Lord. I think I experienced a heavenly moment when I saw this post. I love them, LOVE LOVE LOVE them. I’ve never seen ones like these, and I must give it a go. I found these gluten free crumbs that would be an awesome sub for the panko … alas no gluten in this family … but gosh I bet it would work awesomely in your recipe! YUM! These look so cute. 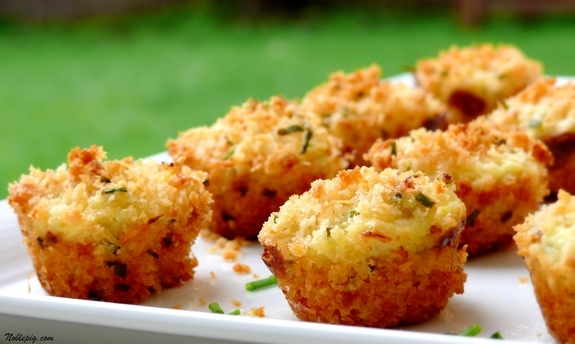 I love the idea of making crab cakes in muffin tins. My husband loves his crab cakes to death, but I have trouble frying them in a way that stays cohesive. This really helps solve the problem. This is genius. The breadcrumb mixture in each cup and being able to bake them all at once. Perfect. This may be the recipe “find” of the year. These sound unbelievable! I never have a problem with freezing. Those are completely awesome, may okay will make them. I love these little gems! So easy if you can make them ahead of time too! Hi Cathy! Crab cakes are one of my all time favorite things. I’ve actually had crab meat from a can at Trader Joe’s that is really good! I think I might have to make these too; I think for Easter! Oh my! My mouth is watering. I have been on a Crab Cake binge lately. These look fantastic! Even better, they don’t have any mayonnaise in the recipe. Crab is just one of my all time favorite foods. Wow. Those look absolutely amazing. My husband is from Baltimore and refuses to eat any crab west of West Virginia. It’s really ridiculous. That said- we’ll be back in Baltimore this weekend so I’m sure we’ll have plenty of crab for Easter and I might have to use this recipe while I’m out there… Thanks! Beautiful pics. These were absolutely delicious! Although mine did not look as pretty as yours…they were amazing! Thanks so much for posting. EVERYONE at my dinner party loved these crab cakes! The recipe works perfectly and came out exactly like the photo! I amwondering if imitation crabmeat would make this gross or not? what do you think? Can these be made in a regular sized muffin pan? I would like to make these as an entree. You can always try it. These look so amazing! I’m going to give it a go this weekend for a dinner party. Suggestions on a sauce to pair with them, or do you think they won’t need it? please add me to your blog subscribtion. These look great! I would love to make these for a wedding. Is it possible to bake them the day before and reheat the next day? You will lose the crispiness. I made 36 minis had some filling left so , doubled bread crumbs . I will use the leftover bread crumbs to coat chicken for dinner. I’ve made these many times since the recipe was first introduced to us and they have been the hit of EVERY party. Delicious! Do you know if these freeze well? Or how many days in advance you could make them? Thanks. I have never frozen them so I can’t really answer that. The most important thing is that the crust is crisp, if they sit too long you won’t have that. Just put these in the oven!! I didn’t have any citrus fruit on hand, so I used about a teaspoon of lemon pepper seasoning. The batter tastes great, can’t wait to try them hot out of the oven. Thanks for the great recipe!! can you use imitation crab meat for the mini crab cakes? Hmmm…you can…not sure how that would taste though. These are great and a big hit with all . Very easy to make. These little gems were exactly as you described! 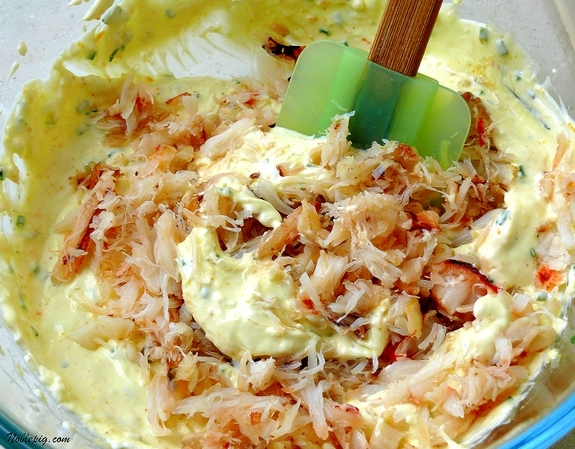 Crunchy, creamy and crabby! This appy is definitely a keeper! every time I make them! I really like them but a little to lemony? Not sure why, used fresh lemon zest…. So excited to have found this recipe! Do you serve with tartar sauce? I am making them for a party tomorrow night. Thank you! I usually don’t, enjoy them. Can I make them the night before and then reheat? Amazing idea. Looking for recipes I can make for a Champagne Strawberry shower, and like this recipe, but wonder if they could be frozen ahead of time and taken out and reheated. I have never done it. I feel like I remember someone saying they did at one time but I could be wrong. 1 what success did you have freezing them and re heating them?? 2 anyone substituted smoked salmon or shrimp, suggestions? Made these last night, and substituted Laughing Cow Creamy Asiago for the cream cheese. Also made them full muffin size, because, Heaven help us, this was going to be dinner, not an appetizer. A little rich for an entrée, but hey, sometimes you just gotta live a little. An extra 7 minutes in the oven got them done just fine. Terrific! I can see how mini-muffins of these would vanish in an instant at a party. Hi I’m always looking for appetizers I can masked ahead and freeze. Can you do that with these? I haven’t tried it, not sure how crisp they stay after freezing. I would give it a test run. These look amazing! Do you think that they could be made ahead and frozen? These are very good and easy to make. I used 8 oz crab since that is typical package size. I made the filling and breading one day ahead and stored separately. Added melted butter the day of serving. Great flavor. I have made these for a Christmas party for the past 3 years. Although I am not a big fan of crab cakes everyone loved these and all of the 96 I made were eaten that night. This is a favorite that I can not ever take off my party menu. I made these for the first time for a party and they were a hit. The flavors are perfect. This will be one of my repeat recipes. I made these this weekend and they were just fantastic. I didn’t have any cayenne pepper, so I added Old Bay seasoning and everybody raved. I had one guests from Maryland who said she grew up eating crab cakes and these were the best she ever had. Thanks so much for sharing! Five stars! These are easy and fabulous tasting. I love the citrus and the panko gets perfectly crisp. I love that the crab mixture can be made a day ahead.. I had leftover crab mixture after 24 minis and opted to make four standard size cakes. Cooked, stored and had for lunch the next day. After reheating, crisp and tasted great.